Upstate Metal Recycling in Fort Wayne, Indiana has taken the e-waste recycling by storm. Not only does recycling your e-waste safely save billions of dollars, but it also saves it from being exported to countries that fail to dispose of it properly. As beneficial as e-waste has proven to be, there’s still an issue that many consumers struggle with; that issue being the correct way to dispose of batteries. Too many batteries are ending up in landfills and contaminating the ground and the water beneath it. Several battery companies have gathered together to form the Corporation for Battery Recycling (CBR) to help bring more awareness to this growing problem. If you find yourself in Fort Wayne or in the surrounding area, Upstate is more than happy to help you exchange your scrap for cash. 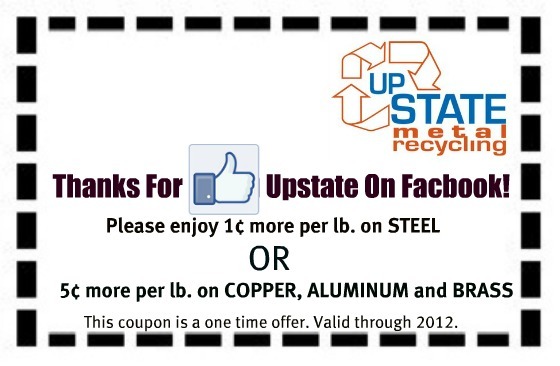 Upstate Metal Recycling takes great pride in giving you a great deal on all your steel, aluminum, brass, copper, electric wire, cars, shingles, etc. You can even ‘Like’ them on Facebook for a coupon on your next visit to the yard. On Friday June 28, 2012 Accuweather.com reported that a “super derecho” of violent thunderstorms spread a distance of 700 miles throughout the Midwest and mid-Atlantic. Fort Wayne, Indiana saw its fair share of damage on Friday including over 500 trees down and 70,000 without power. Now that the city is slowly recuperating from the storm, it’s time to start accessing and cleaning up the damage. Upstate Metal Recycling, a locally owned company in Fort Wayne has started collecting several uprooted pieces of scrap since Friday’s storm. If you find yourself in Fort Wayne or in the surrounding area, Upstate is more than happy to help you exchange your scrap for cash. Upstate Metal Recycling takes great pride in giving you a great deal on all your steel, aluminum, brass, copper, electric wire, cars, shingles, etc. You can even ‘Like’ them on Facebook for a coupon on your next visit to the yard.